The Mrs. Yoy Blog: ICE ICE BABY! Another day, another trip to Costco. This time, we dragged a visiting Grandma Yoy along. After we had piled our cart full of things we marginally needed, the Yoys and I waited by the exit for my mom to get her iced coffee fix. The food line was moving S-L-O-W, but finally, the lady in front of Grandma Yoy received her heaping cup of fro-yo and was headed our way. I was eyeing her yogurt. Dang, that looked amazing. I tried to turn away, but it had me in a trance. Apparently, I wasn't the only one. Big E was also eyeing the fro-yo. Only he took it one step further, as always. As the lady approached our cart, Big E broke into song. The woman laughed at Big E and even gave him a wink, but none of her frozen yogurt. I'm sure she was wondering why a three year old had Vanilla Ice on the brain. 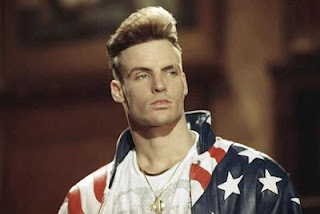 Before you go judging me AGAIN, in my defense, I would like to state that Sirius Radio 90s on 9 plays the hell out of some Vanilla Ice and you can't deny the hook. Big E WISHES his hair was this glorious!